As an IT Technician, I approve of this password policy. Error: Your very secure password looks too much like a very secure password. I know how that feels, Chicken! It’s worse when we have to change it every 90 days or so. ARGH! 90 days? I have to change mine every 60.
hahaha Story of my life! That’s the story of my life!! I’m forgetting passwords all the time! AND you can’t write it down!! Good Luck, Mr. Phelps…. Therr is a point when password security becomes so rediculpus it becomes insecure because the more complex you force someone to make their password the more likely it is to be written on a Post-It note attached to the monitor. I’ve seen studies which suggest that the ideal approach to password security is to require a long and complex password but not require it be changed more frequently than once a year. Unfortunately, I can’t seem to convince our director of IT security of this. It’s not usually Government Bureaucracy, but Corporate Law which is to blame (in the workplace). Everywhere else, it’s willful stupidity. BTW; if we could remember obtuse passwords, would we need computers so much? Do you know how I came up with it…? It’s the first letter of each word of the title of popular movie about a boy wizard. Pretty easy to remember once you know the mnemonic. Instead of movie titles, use lines from poems or book titles. I worked in a place that didn’t allow me to repeat the last 15 (YES, FIFTEEN) passwords. Insane. 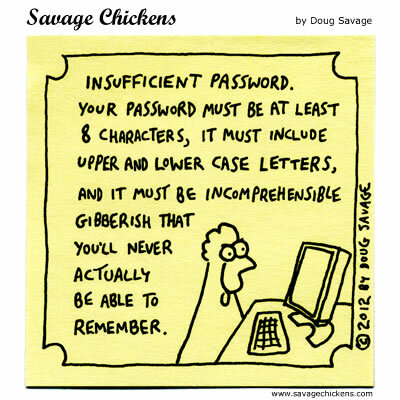 For the full effect, passwords should be required to be at least 8 characters but no more than 10.